Finnair is the first European airline to take delivery of the A350-900 and the third worldwide, after Qatar Airways (see news, December 2014) and Vietnam Airlines (see news, June 30). The 297-seat aircraft is configured in three classes with 208 seats in economy, 43 in Economy Comfort and 46 in business. To view a seatplan, click here. Qatar Airways’ A350 seats 283 passengers (to read a flight review, click here), while Vietnam Airlines’ aircraft is in a three-class configuration with 305 seats. A list of A350 flights is available here. First, some context. The long-haul market is ferociously competitive, with airlines constantly raising the bar on what is being offered in economy and business class and, in a few cases, first class. Seating, food and drink, inflight entertainment, the provision (or not) of wifi are all important factors, as well as the aircraft themselves — most airlines of note are taking delivery new generation aircraft such as the A380, B787-8, B787-9 and A350 XWB. Finnair is a small player among this global competition, although it has certain advantages it is determined to make the most of. Oneworld member Finnair’s home airport in Helsinki is small, efficient and on a route taken by many flyers. This makes it an alternate hub for flights to Asia – ideal, as Finland’s small domestic population of five million means Finnair relies on vital connecting traffic to keep itself afloat and provide a short-haul domestic network. The new A350 is also a chance for Finnair to offer what CCO Juha Jarvinen calls “Nordic hospitality and design”, the aim being to consider the small details, everything “from the personalised service by our cabin crew to the details of the onboard design”. In practice, that means making the most of the new features of the A350 and adding Finnair’s own “Finnish” to them. The A350 has larger windows, accentuated by the clean white, blue and silver/grey colour scheme by design firm dSign Vertti Kivi & Co.
On-board, as with other new generation aircraft, the dynamic ambient mood LED lighting can gradually change to suit the time of day, destination or season for a more relaxing flight experience and calming atmosphere. Finnair has 24 different scenarios for this lighting, including called the Northern Lights. Both food and drink are Finnish. Economy has new and improved meals – an aperitif service with savoury snacks has been added to the first meal. Business has an A350 signature drink called Blue Sky, a mix of Champagne and Finnish blueberry liquor. A business class menu by Kari Aihinen, executive chef de cuisine at Restautant Savoy in Helsinki with specialities including vendace roe mousse, warm smoked arctic char and wild reindeer. Tableware and textiles in business are designed by Marimekko. Economy seating is nine-abreast in slimline seats with a 31-32 inch seat pitch, while Economy Comfort seats are also nine-abreast and have an increased legroom of 35 inches. Business class passengers, Finnair Plus Gold and Platinum members and Oneworld Sapphire and Emerald members have complimentary full internet access, while economy passengers can purchase wifi either by the hour (€5) or for the duration of the flight (€15). Obviously, this was very different from a normal flight, and so the onboard greeting and service wasn’t typical. That said, the menu is indicative of what you will get, as was the experience of the seating. Business class is in two cabins, with a front cabin of eight rows and then a smaller rear cabin. Between the two on the left-hand side of the aircraft is where you’ll find the “ladies only” toilet, although on this flight it was being used by both sexes (separately, for the most part, I believe). Business seats are spacious with a lot of room. The 1-2-1 configuration means everyone has direct access to the aisle, as well as more privacy since you don’t meet anyone’s eyes when sitting down. The design is elegant white with grey detailing and makes the interior seem airy, although some might say it lacks character. Splashes of colour come from the amenity bag and the pillow and bedding, in white and blue and white and green respectively. The IFE screen comes out from the side of the seat in front and has a 16-inch screen which can be tilted in various ways, depending on the angle you are at when watching. The tray table is removed from the armrest and then folds out to a decent, if not generous, size. As you’d expect on a brand new aircraft, it was firm and I had no trouble using it to work on my laptop. There is in-seat power with capability for US, EU and UK plugs. In addition, you can charge your phone using the USB power. However, this is very slow and would take most of a long-haul flight to recharge an empty device. Waiting at the seat were slippers, an amenity bag containing Clarins products and BOSE noise-cancelling headphones. For individual flyers, probably the window seat, if only because of the larger windows that are fitted on new generation aircraft such as the A350 and B787. One point, though, is that in the front cabin the only overhead lockers are above the window seats, so you have more headroom in the centre seats and are less likely to bang your head if the locker is down, but you may struggle to find somewhere to put your bag. The lockers are a good size and can store wheel-on bags on their sides and pushed in lengthwise. On take-off, the pilot dipped the wings to say goodbye to the Airbus factory, and then climbed quickly through the clouds. Hot towels were offered, and the IFE came on. However, the wifi proved a little more problematic. The key code for business class passengers is displayed on the IFE screen, but I found that mine was an invalid code, and sorting this out took quite a while (beware of capital “O” which might just as easily be “0”). Although the food was brought on a tray on this occasion, I was told the standard service is for the tray to be used for the starter, and then the main courses and subsequent items be brought individually. A more representative menu can be found here. This flight was too short and too busy to assess the seat for sleeping, but I reclined it fully-flat and there was plenty of room to turn around and get comfortable, although obviously I would not have been wearing a suit and shoes to do so. As you’d expect, the armrest goes down for take-off and landing, and also to make room when the seat is fully-reclined, but comes up if you want the armrest when you work. There’s also an extra storage compartment in this area. There are steps in the side of the seats for reaching overhead lockers, though actually there are no overhead lockers above the central seats. There’s plenty of room in the aisle so you don’t get knocked as people walk by, and the flight attendants brought everything individually apart from the main tray. The staff wear a deep blue uniform and were helpful and friendly on this flight. Obviously, with their top management on board, it probably wouldn’t be the moment to retire to the galley and relax. There was a lot of pride in receiving the aircraft, and everyone seemed happy and pleased at that moment. I did not get chance to fully investigate the Panasonic IFE system but there was a fair choice of films and the 10 minutes I watched of the Mad Max remake were enough to convince me that both the screen and the BOSE headphones were excellent. There is also a good flight map options and two angles of external cameras for those who enjoy watching take-off and landings. The flight was over all too soon and we took a scenic fly over to Helsinki before landing at the airport for a water cannon greeting from the airport fire brigade and more speeches from the dignitaries at Helsinki Airport. 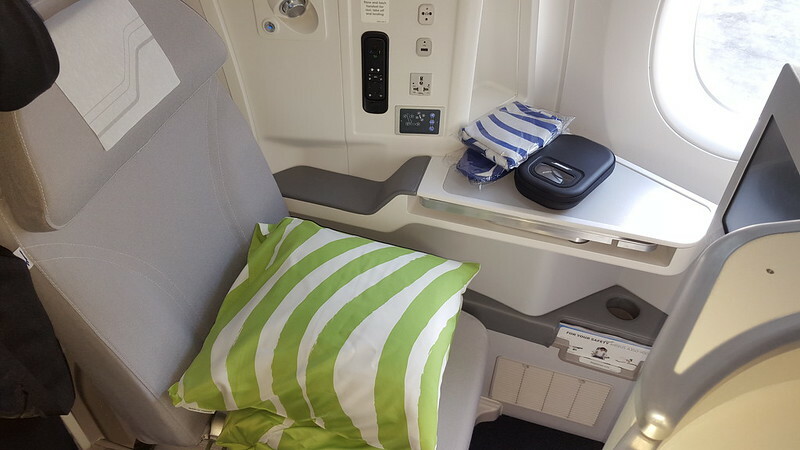 Finnair and those who fly with her have been waiting for a long time for the A350 but now it’s here and it;s good to be able to report that the onboard product is excellent. 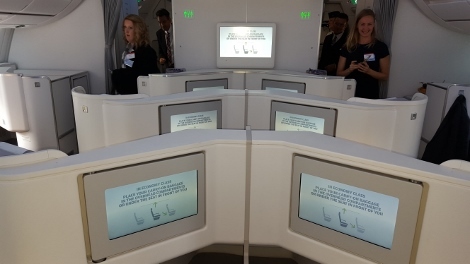 The benefits of the aircraft itself are well known, even if Finnair is only the third carrier to fly the A350, but onboard the airline has wisely chosen top class seating and a design and service ethic that will fly well both with those wanting to visit Asia and (the airline hopes) Asians wanting to visit Europe. Not surprsingly no one was talking about “price” on this flight since the aim is to achieve differentiation and actually charge more, but the fact remains that for European flyers prepared to make a stop on the way to Asia, the airline offers good value for money, and it now has an excelent aircraft to match. There are three more A350s coming in the near future (see the link in the article to see where they will be flying), and a total of 19 before 2022, so along with the improvements on the A330 and the retirement of the older aircraft, the future looks bright for Finnair.